Use the temporary ladder while you are installing the outside ladder. Figure 9-22. - One-piece flanged elbow installed on the inside of the tank. ladder aside. Remove the nuts from the bolts. Set the outside ladder back over the bolts. Install the nuts on the bolts. lighten the bolts. Tighten the bolts by attaching the braces to the bottom of the ladder. Remove and disassemble the temporary ladder. 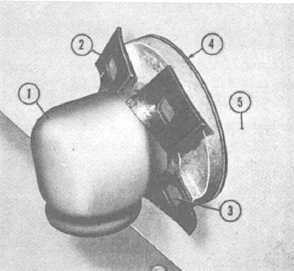 FLANGED ELBOW. - Install the elbow (fig. 9- 22, #1) inside the tank on the stave. Cut four one-hole gaskets. Force the gaskets over the bolts. Insert the bolts through the flange of the elbow. Place the blocking under the heads of the bolts. Force a gasket over the bolts. Turn the inlet of the elbow toward the tank bottom. Insert the bolts through the stave. Install the nuts temporarily on two bolts while you are assembling the valve. 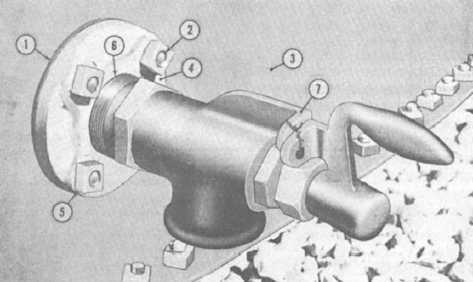 Remove the nuts before installation of the valve. Figure 9-23. - Water drawoff valve installed on the outside of the tank.